It was the year 1893. 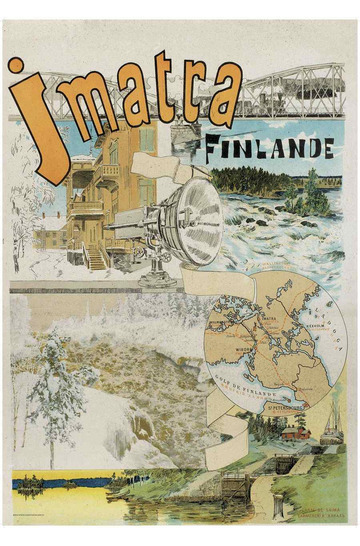 The roaring Imatra Rapids in eastern Finland represented the country’s primordial mother, its beauty, everything. New lighting systems that illuminated the rapids and a brand new hotel served to spread the message to the whole world. By using the equivalent of the internet at that time – a placard, of course! So the artist Axel Gallén (later Akseli Gallen-Kallela) stands by the rapids, drawing. Naturally, Gallén has captured the rapids, but unconventionally he has put the spotlight centre stage. In the background, the new hotel is visible, as is the Saima canal and the bridge that crosses the Vuoksi river. The pride and joys of Eastern Finland in a nutshell. 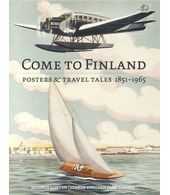 Finland’s first graphic travel poster had been born! 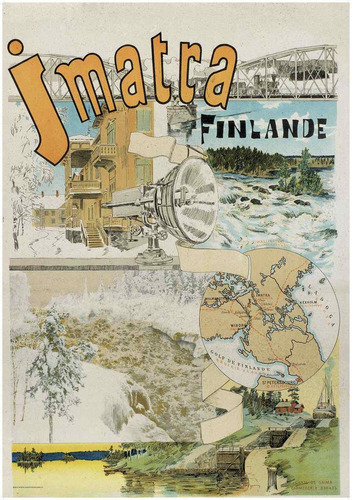 The Imatra’s giant bosoms rise and fall under the weight of her big cool lungs; defiantly, threateningly, a testimony to eternal life, Imatra dances on in her self-willed game.